So after clawing every bit off use out of my ~10 yo desktop, it's at the point where modern web apps can cause it to cry and I can't play most modern games even on minimum settings, so I'm finally biting the bullet and looking to drop in the ballpark of $1500 (not a strict budget) to put together a decent rig for myself. I've put together computers before, but this is the first time I'm actually buying all the parts individually, so some reassurance from the gurus here that I haven't overlooked something and either outright forgotten something important or mixed incompatible parts would be nice. 6th generation (6000-series) i7s were literally just released. Supply is tight (totally sold out on Newegg and various retailers right now), but you likely want the latest and greatest if you're spending a big chunk. If you're sticking with 4th Gen, DDR3 is necessary. Know about the 3.5GB issue. Despite being marketed as a 4gb card, it only has 3.5gb at full speed. (the last 0.5gb slows down the card severely). Yeah, all 4gb exists... but you don't want to use the last 0.5gb. The other issue is FreeSync vs GSync. I personally prefer FreeSync so I choose AMD graphics cards. If you're cool with 3.5gb (which seems to be sufficient for recent games...), the 970 doesn't seem to have any other issues. The R9 290x however is a full 4gb card, and the R9 390X is an 8gb card... which offers some degree of future-proofness. I do have friends who heavily mod their games and have been unable to run the (highly-modded) Skyrim... for example... on a 970. If you mod or use significant amounts of RAM, the 3.5gb issue may bite you. Also, $1500 budget likely means you can afford the full GTX 980 (or 980 Ti) or even a AMD Fury (or Fury X). GPUs are one of the most important purchases and have the biggest correlation to gaming performance. From a gaming perspective, it is more important to spend on the GPU than to spend on the CPU. Getting an i5 + 980 will be faster than getting an i7 + 970. So yes, you have excessive wattage for sure. If you want to spend more money, pick up Silver Certified or Gold Certified... or full-modular PSUs. If you want to build-out to be SLI-ready or Crossfire-ready... then maybe upgrade to 800W or higher. 750W is kind of at this awkward place. Or spend the extra money on a component that actually improves performance (GPU or whatever). But if you are getting a good deal on 750W, there's no real "problem" with it. Its just overspec'd. I have monitors/keyboards/mice/HDDs around so I don't really need those, and similar with optical drives (although I suppose they're like 20$ so I might pick one up anyway). Is there anything critical I'm forgetting otherwise? Does that build seem reasonable, or are there better performance options out there for comparable price I should be considering? Solid State Drives are much cheaper now. There is literally no excuse, you should get a 500gb+ SSD or maybe a 1TB SSD. BX100 is a very good entry-level SSD... if you want more features I can list off some more expensive brands. You might want a new HDDs. Toshiba 5tb Hard Drives are only $140. Pick up two of them, RAID1 them together and enjoy a significant backup solution for your personal computer. Don't forget ~$100 for Windows. I would recommend upgrading to a GSync (if you choose NVidia) or FreeSync (AMD) monitor, gaming quality mouse (like Logitech G502), and a gaming-quality n-key rollover mechanical keyboard. Those are the only letters that I can type when both shift keys are pushed. Different keyboards have different issues (iirc: Mac keyboards tend to pass the double-shift test, but fail at pushing awsd at the same time). Fighting against your keyboard while gaming is the worst... you need to upgrade to an n-key rollover keyboard at minimum if you want to game. Mechanical keyboards in addition have consistent key pushes and are pretty nice upgrades. All in all, it will be ~$100 for a good quality mechanical keyboard, with the most expensive brands hitting $200 or so. Thank you for the insights, I'll certainly look into 6th gen stuff, and give consideration to the R9 390x as an alternative to the 970, especially given they (the GPUs) appear to be roughly the same price. I should clarify that the $1500 I mentioned is Canadian dollars though, so that's more along the lines of $1100-1200 US, and as such I think going another step up in GPU is probably not financially practical. If I find myself in the situation where going $100 over budget nets me a pretty big step up then I can probably bite that bullet, but overshooting by 200+ is another matter. I suppose I can explore the idea of downgrading my build to an i5 in favour of a fancier gpu, but I rather like the idea of having an i7 simply because it's the 'best' in a coarse mainstream sense even if leaning towards the gpu might be more practical for gaming. Getting a decent gaming keyboard/mouse(/headphones) are on my radar for a follow up purchase once my bank account has had a chance to heal a bit, and similar goes for a SSD/HDD. AFAIK I can get by with a (relatively) tiny 250GB HDD (for 'free') with no harm to performance so long as I limit myself to a handful of installed games at once. I'm not much of a video hoarder or similar, and I tend to focus on a single game or two at a time anyway, so I really don't need much more space. I do appreciate the explanation as to why someone would want to spend 100+ on a gaming keyboard though, as unlike a mouse it seems like all you'd be getting is a lot of gimmicky back-lighting and macros versus any actual performance differences. That said, I probably have been bitten by that rollover issue before without realizing it, so knowing that's an issue I'll be potentially avoiding will help me feel better about dropping 100+ on something 'free' like a keyboard later on. Dopefish wrote: Thank you for the insights, I'll certainly look into 6th gen stuff, and give consideration to the R9 390x as an alternative to the 970, especially given they (the GPUs) appear to be roughly the same price. I should clarify that the $1500 I mentioned is Canadian dollars though, so that's more along the lines of $1100-1200 US, and as such I think going another step up in GPU is probably not financially practical. Ah, I thought you were going all out with $1500 USD. But $1100 is still a good target to aim at. If I find myself in the situation where going $100 over budget nets me a pretty big step up then I can probably bite that bullet, but overshooting by 200+ is another matter. I suppose I can explore the idea of downgrading my build to an i5 in favour of a fancier gpu, but I rather like the idea of having an i7 simply because it's the 'best' in a coarse mainstream sense even if leaning towards the gpu might be more practical for gaming. Look, the difference between a 970 and 980 is approximately 20% improvement. The difference between i5 and i7 is... 8% on single-task performance, maybe a little bit more on multi-tasking. And 0% improvement in gaming. (Gaming is entirely GPU today). So while you're spending literally hundreds of dollars chasing single-digit or double-digit improvements... a good quality SSD improves your I/O system's performance by a factor of ~3000% (to ~5000% or even 10,000%. Yes, a 100x improvement if you're going for the very high end). Even the cheapest, lowest end SSD will easily be 1000% to 2000% faster than a hard drive. Do you know how much IOPS a hard drive can do? Like 150 IOPS for a very nice hard drive (WD Blacks are among the fastest 3.5" hard drives today). The best SSDs are hitting 10,000 IOPs and above. I'm really not making these 100x faster claims up at all. 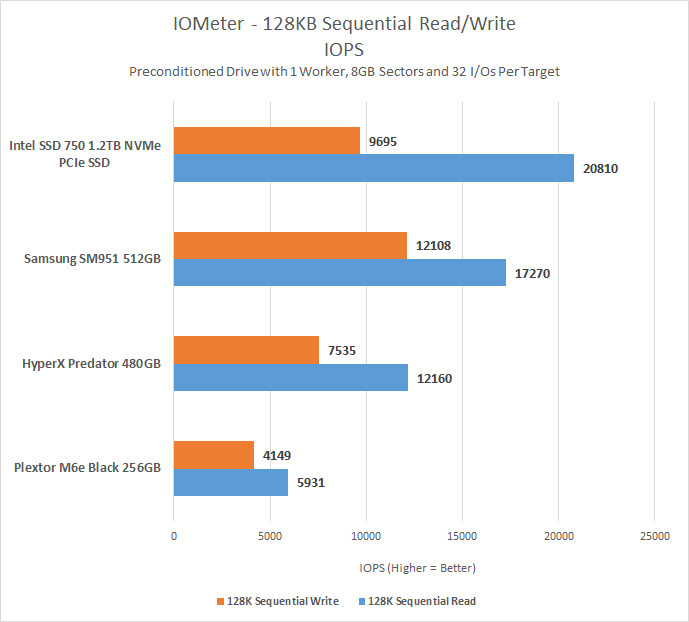 (IOPS is a better benchmark for typical users. I do realize hard drives have excellent sequential read/write speeds, but that's not how people use computers). IMO, it makes no sense to spend well over a hundred dollars going from an i5 to an i7 for what becomes a 8% improvement... and then ignore the 1000% to 2000% (yes, 10x to 20x) improvement that a cheap $90 BX100 SSD offers over even the best hard drives. I should note that the 500gb and 1tb SSDs are both faster and bigger... so they are worth more than double (or quadruple) the smaller and slower drives. But if you are pinching pennies, the 250gb BX100 is still going to be many multiples faster than a hard drive. On a hard drive, the "arm" of the hard drive needs to physically move to the location of the data before it can start reading (or writing). But for SSDs, all data is available virtually instantly... no waiting for mechanical arms to move around. Upgrading to an SSD just makes the most sense, and is the most important factor of modern computer builds. IMO, the main issue with SSDs is that all the companies are testing new technologies out all the time. The BX100 is an older "MLC" design that should be reliable. "TLC" designs are beginning to hit the market (ie: Samsung 850 Evo). Because TLC is a newer technology, I'm distrustful of it and prefer to stick with MLCs that have at least 4 or 5 years of good reputation right now. So the BX100 is a cheap and conservative choice. (The TLC drives have had issues however... to be expected of a new technology of course. But I'm going to wait a few more years before trusting my data to a TLC drive). I can understand wanting to stick to older technology for reliability purposes (ie: You "trust" hard drives more because SSDs don't have decades of history backing them up yet)... but if you are building a "high performance" computer, already upgrading to the relatively exotic i7 over an i5 and all that good stuff... the SSD just makes a lot more sense. Basically, i5 + SSD is much much much better than i7+Hard Drive. Well, now that I know that your budget isn't an absurd $1500 USD... I'll note that mechanical Keyboards are the highest end keyboard. There are simple rubber-dome key keyboards with n-key rollover available. I'm not too familiar with those brands... but n-key rollover is the most important feature to look for. Alright, I suppose you've sold me on picking up a SSD in the same purchase, most likely that 250gb one you prescribe, although I'll look around for deals on 500. I knew SSDs were 'faster' than HDDs, and vaguely knew why, I just don't think it sunk in how significant an impact is was. It puts me a bit over where I'd like to be in terms of budget I think, but I suppose I was going to get one eventually anyway so I'm just front loading the expenses somewhat. With the holidays not 'that' far off (and my birthday the same season) I'll probably splurge on getting high end accessories then. In theory getting a high end mechanical keyboard should be a relatively futureproof investment would it not? Mechanical+NKRO seems to cover everything one would really want from a keyboard, and theres nothing left to really scale up AFAIK so a high end keyboard today seems like it'd perform just as well 20 years from now unless I'm overlooking something. Dopefish wrote: In theory getting a high end mechanical keyboard should be a relatively futureproof investment would it not? Mechanical+NKRO seems to cover everything one would really want from a keyboard, and theres nothing left to really scale up AFAIK so a high end keyboard today seems like it'd perform just as well 20 years from now unless I'm overlooking something. My understanding is that the technology for the keys themselves has been quite stable for 20 years or more. It's been brought to my attention I can get Corsair Vengeance Pro 16GB (2 x 8GB) DDR3-2400 Memory for the same or cheaper price as DDR3-1600 or 1866 (as I have above). However, as far as I can tell, DDR3-2400 ram operates at 1.65 volts versus the CPU recommended maximum of 1.5V+5% (1.575V). Googling around seems to give mixed messages ranging from "Yeah it's fine, it'll void warranty but there's no problems" to "Don't wast the money on faster ram; it's negligible improvement at best and at worst causes damage". Given that the price seems to actually be cheaper, is it reasonable to get the 2400 anyway? If I do nothing (i.e. don't enable any XMP profiles) will it just be treated as 1600 (and operate at 1.5V)? Would I be able to get the 2400 sticks and have them operate as 1866 (which I gather is the highest speed that operates at 1.5V) ones instead? It's my understanding that games aren't particularly prone to caring about memory speed so I suppose the safe thing to do would be to just get standard 1600s, but I don't want to miss out if I could be getting (even marginally) better stuff from the same price. Dopefish wrote: It's been brought to my attention I can get Corsair Vengeance Pro 16GB (2 x 8GB) DDR3-2400 Memory for the same or cheaper price as DDR3-1600 or 1866 (as I have above). However, as far as I can tell, DDR3-2400 ram operates at 1.65 volts versus the CPU recommended maximum of 1.5V+5% (1.575V). Well... DDR3 doesn't work on most 6th generation Motherboards. So... if you're getting a 6000-series, the entire DDR3 question is moot. DDR4 only if you get the new stuff. DDR3 is only interesting if you're trying to get a cheaper deal on the older 4000-series CPUs / Motherboards. Windows 10 is already out and well known from a hardware requirement perspective. Don't spend lots of money where you don't need to on CPU (extra cores especially)/mobo/memory (both volume and speed). Focus on a single powerful graphics card if you have any "discretionary" decisions to make. I agree on using a HDD as a boot drive as antiquated by this point but that shouldn't really even be an extra cost, it's just assumed. I'd also point out costs of monitors, cases, good quality power supplies, mechanical keyboards, a good mouse, etc are costs that can cover multiple iterations going forward in years. Spend money more liberally there too than on internal bits with shorter usable lives. I'd recommend getting a fairly cheap i5 (4xxx), 8GB of cheap DDR3, and an inexpensive board.